Watch the interview in Swedish on TV4 Play HERE! 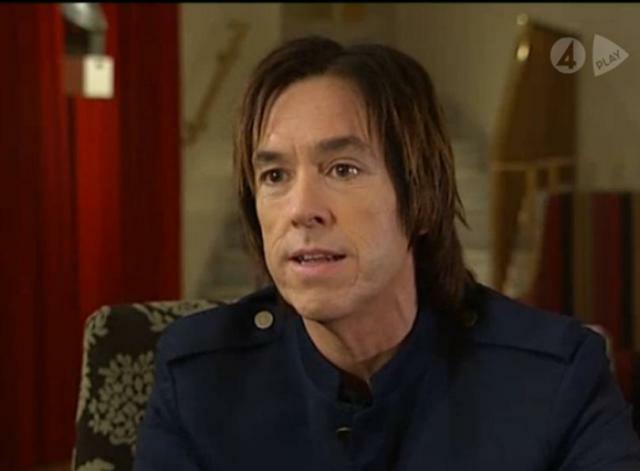 Rep: In February last year I met Per Gessle and Marie Fredriksson in their rehearsing room, before the world tour that they are doing now. Now they have been on tour for 14 months and it is the biggest tour in the world. 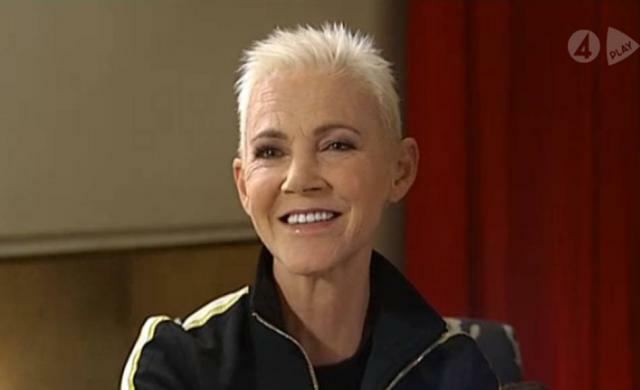 The fact that Roxette can be on stage again depended on Marie Fredriksson, who had fought a lot against the brain tomour. It was also important for her to be able to resist in this tour. 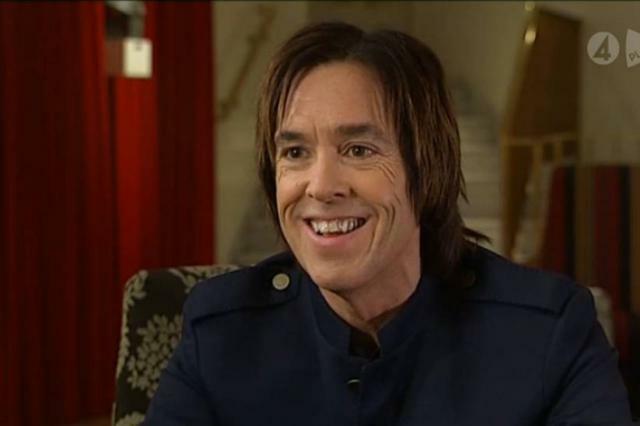 In this exclusive interview Per Gessle and Marie Fredriksson talk about this journey which, in spite of all odds, has been done. 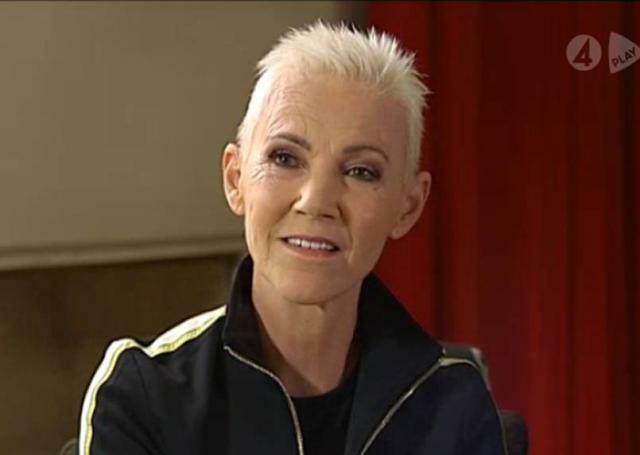 Marie Fredriksson, welcome to Nyhetsmorgon. Rep: Last time we met was in February 2011 in your rehearsing place, before this world tour, you told me that you had planned 49 concerts and that you would go to Kazan. It feel like it was a few days ago. Per: Yes, indeed. Time has gone really fast. I use to say that for every planned show, we add two more shows. That is why it has become like that. Rep: That time you had planned 49 concerts and I remember that we were talking here and your phone rang and you disappeared. Then you came back and said: “now Wembley has been booked”. It feels that you understood in a way that this would be quite huge. Per: Well, not this way. We were not prepared for that. I think that this year, after Australia and Asia, it feels that it has become a global bonanza, which is really great I can say. Rep: I have read somewhere that this is one of the biggest world tours of today. Marie: Yes, it is incredible, it feels wonderful. Rep: But what have you offered that it has become so successful, so popular? Is it nostalgia, is it anything new, have you thought about that? What have you done that it has become so popular? Per: I think that it is nostalgia, of course, we have a greatest hits concert and there is an enormous amount of people who grew up with our music, we had 7 – 8 years when we were really big, namely at the beginning of the ‘90s and the end of the ‘80s, so that success is still present. We worked in the music branch in a time when it was possible to build a song catalogue, a long career; it is much more difficult nowadays, from different reasons. You can see that nowadays, the artists who sell tickets on football stadiums in the world are the old artists. There are also exceptions, but we always talk about Rolling Stones, AC/DC, U2, Madonna or Bruce Springsteen. Rep: Why is it like that? Per: Because there are artists who have enough songs which touch people’s souls, songs which mean something for people. Today they talk much about being famous, or becoming famous during programs like “Idol” or “X-Factor” or what it can be. Rep: So you can say that the presenters want a quick-fix, to find a new unknown person who can sell lots of CDs in just a few weeks? Per: Yes, perhaps the record companies don’t give you enough time to write your own material. And you need time to find your style, your own sound, in fact. So perhaps nowadays this branch doesn’t give enough time to artists and song-writers. Rep: Do you see also younger people in the audience? Marie: Absolutely. It’s so nice that there are so many young people and quite many old ones, as well as people of average age. There are many people in our age, too. It is incredible that you can see people of all ages. Rep: I know that when we met last time, we were talking about the fact that you could do it in a way, that it was possible to do it. I asked you and I am sure that many people have wondered: will Marie manage that? Marie: Yes, there are quite many who were worried, but I felt inside my soul that it would be good. I felt so strong. And first of all there is that entire good mood which has been great. Rep: But have you experienced situations when it didn’t work or when it was very difficult? Marie: No. Not at all. It is just to sleep properly. It’s important. Rep: And there were no cancelled shows or something like that just because of you, of how you felt. Marie: No. It has always been very well. Rep (to Per): Could you be a bit more relaxed by having Marie near you, on stage, as during the other tours, or you were also worried about that fact that it would not work and so on? Rep: So you don’t care about Marie! Marie: There is also the fact that we have such a great band, so we feel very well, we laugh a lot, so everything is so positive. Rep: Per was talking about your self-confidence. How long did it take for you to find it and feel strong to be able to stand there in front of 10 – 15,000 people? Marie: Well, it came as soon as I started to sing. That time I stared to feel very well, so I feel like home when I am on stage because I have been there all my life. So I think that it is fantastic to be able to do that again. Rep: So perhaps there, on stage, you feel the most secure, excepting at home, with your family. Marie: It is quite easy when you are full of happiness, there has been great! Then it has become better and better, and the entire band, as well. They made me so strong from the beginning, so it is fantastic. Rep: You have recorded a new album, too, during this tour. Rep: And it is written that you have recorded it during the tour, in hotel rooms and everywhere. You have done that earlier, too, with Tourism. Per: Exactly, ’91-’92. But that is a process that happens with a band that is out so long, there is a fellowship, all become so childish. All the positive energy that existed on tour has been used for music. That was the whole idea of the album, to record it in hotel rooms, in different studios, in those ball rooms of Sun City we recorded some songs, too. There is a lot of new material and it has become a great album which is quite spontaneous and includes fantastic song performances from Marie… So cool. Per: Sometimes I succeed to do amazing things. Rep: It feels that we, here in Swede, don’t understand exactly what kind of adventure you are having now. Rep: It feels like that. Marie: I don’t know…wait…what do you say? Per: I don’t know either. I think that you are right. I don’t think that people have any clue what is happening with us. It’s more interesting for the journalists to write about new people that about the ones that have been in this business for many years. New people, younger ones who are more local, I can say. There is not such a big piece of news that we play in front of 100,000 people in Australia, for example. It is not like that. It is much funnier to write about a little scandal in a TV editorial team. Rep: But did you feel, along your career, especially in the ‘90s, that you were appreciated here in Sweden and that people understood who you were? Per: Well, I think that the mass media was ok to us, it is difficult to see where you are. What does “big” mean? There are many artists who have been big outside the country, like Ace of Base. It is difficult that people, especially the journalists, don’t see the difference between selling tickets for a little club in New York and tickets for Wembley or Madison Square Garden. There is a big difference between them, but here, at home, mass media doesn’t see any difference. But we have been very much in mass media, since we started. Rep (to Marie): Last time when we talked I asked you how it was going with your own material and you told me that you were writing new songs with your husband, Micke. How is it going? Marie: Yes, we are working with that, so we hope that we can release an album next year. We haven’t succeeded to do that when we had so much to do. All material is in Swedish. It was long time ago when I did something in Swedish, so it will be very cool. Rep: We understand that it took a little time to do that. Marie: Yes, but, you know, the fact is that you hurry up; you want to be ready with that. But being on tour with Roxette requires such a big energy, while we want to take it easy with the album, we will work with that. Marie: Yes, it will come. But not really now. Rep: And you, Per, any solo projects for you, too? Per: There will be surely a solo album in Swedish, and surely more Roxette and of course more Gyllene Tider, too, I think. Rep: Don’t you finish now? Per: No, no. It is the same with Gyllene like with Roxette, we have so many good songs and a fantastic audience who want to listen to them. Rep: Of course, we are looking forward to that. Have a happy Easter and I hope that you will go to South America with open arms. Per: We will do that. Rep: It was very nice to meet you. niciodata nu cred ca fanii romani au fost mai la curent cu ultimile stiri din Suedia ca acum! great job! :)) cu placere. Pai trebuie sa fim pe baricade aici, numai ca nu prea sunt asa multe stiri despre ei. Noroc cu Facebook ca mai publica Per cate ceva, iar daca este in suedeza, atunci automat traduc.